Department stores have always been a one stop shop for beauty and fashion necessities. However, technology has enabled consumers to discover, research, compare prices, and buy directly online, from anywhere, at any time. While this has significantly disrupted the traditional purchasing patterns for major retailers, new opportunities have opened in the digital space. In our recent State of Retail report, we performed a high-level analysis of consumer perceptions of the 15 most talked about department stores. An analysis of the top U.S. department stores over a span of 2 years, found consumers in the 0-24 age group to represent 40% of all retail shopping conversations. This younger generation’s attitude of, “I know what I want and I want it now,” has profound implications for how retailers must present their brand and product offerings. Counterintuitive to perceptions of their buying power, consumers aged 0-24 have much stronger attraction to luxury brands. 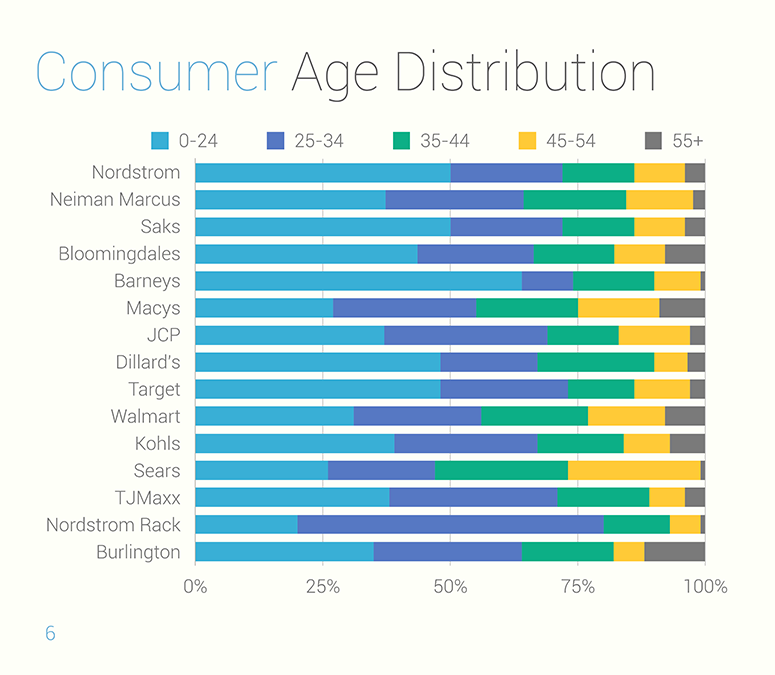 Interestingly, once graduating from this age bracket, consumers aged 25-34 are increasingly more drawn to discount retailers like Nordstrom Rack and TJ Maxx. Families who have expressed shopping for their children online, are purchasing mostly from budget retailers like Target, Walmart and Kohl’s. 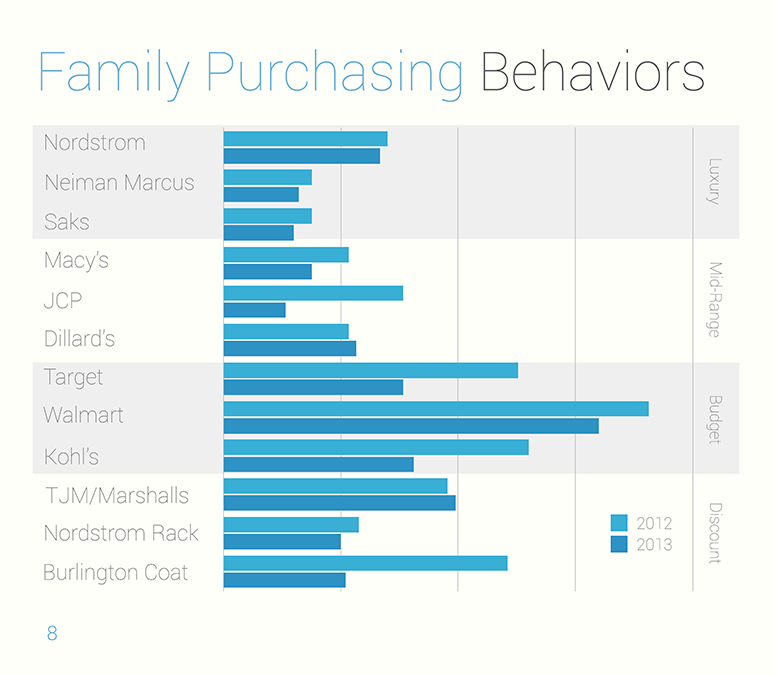 From 2012 to 2013, Dillard’s and TJ Maxx were the only two to see increases in conversations related to shopping for the family. Exclusive celebrity collections and appearances were found to be highly influential for Mid-Range stores like Macy’s, JCP and Dillard’s, while fashion bloggers increased engagement for Discount stores like TJ Maxx / Marshalls and Nordstrom Rack. 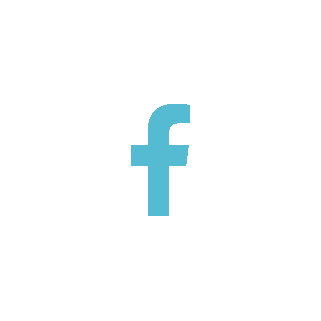 In 2011, Nordstrom acquired HauteLook, a flash-sale fashion and home décor site that had 4 million members. Today, HauteLook and Nordstrom Rack are integrated, and together the two have 14+ million members (Zaroban). 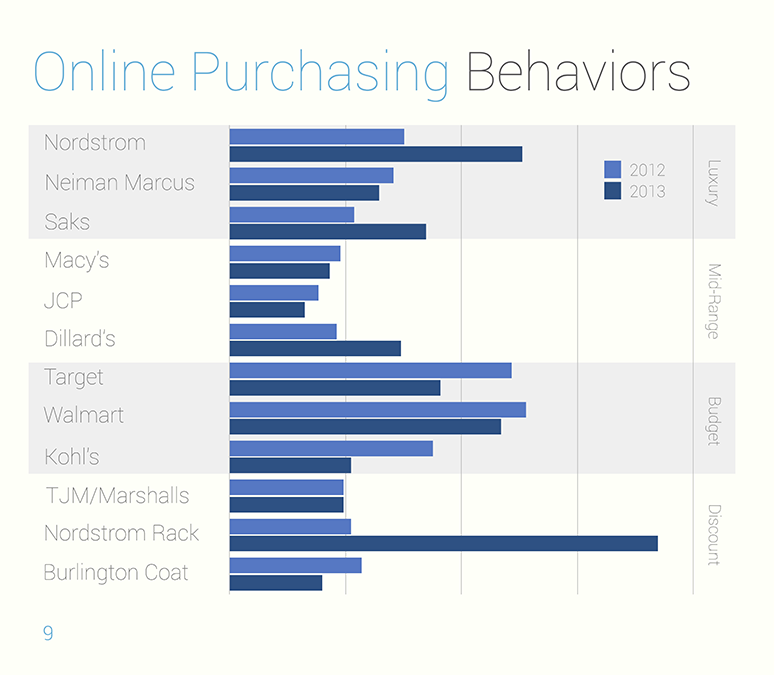 With Nordstrom’s top priority to become as profitable online as they are in-stores, a strong emphasis on e-commerce has been enforced, making Nordstrom Rack a solid unit in the online retail industry (Loeb). 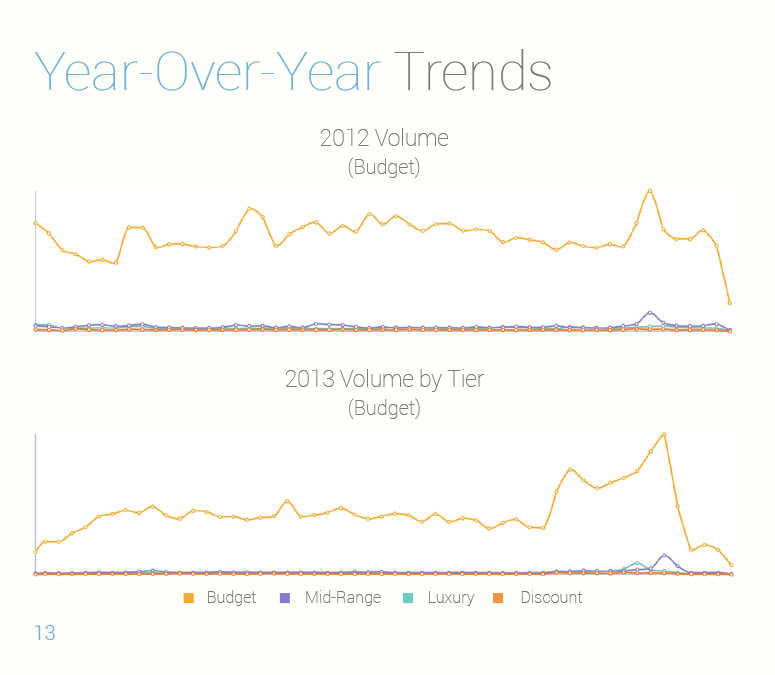 In 2012, brands focused much of their online promotions during the Winter and Summer while online promotions were focused much during the Fall season the following year. 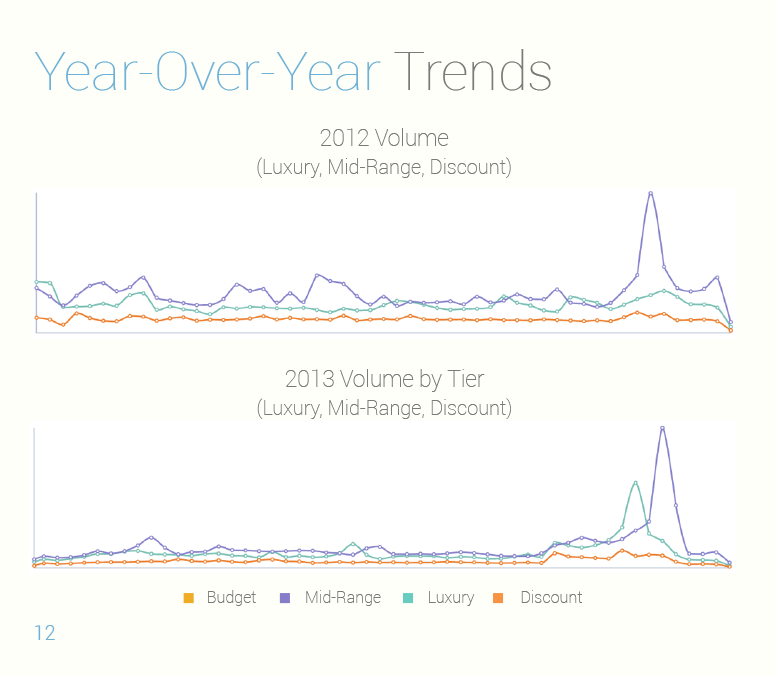 Seasonally, even when brands heavily focused their advertising during the Winter and Summer seasons, consumers were most engaged during the Fall. 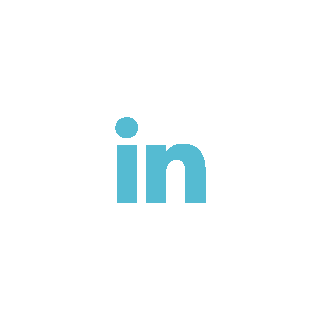 A notable shift was witnessed from 2012 to 2013, as nearly all of the 21 brands analyzed, shifted their marketing strategies to concentrate on the Fall. On the contrary to brands shifting their promotions more towards Black Friday, each year, consumers have become less inclined to take part in the Black Friday extravaganzas. Heavy promotions pushed prior to holidays have increasingly become overwhelming for consumers, making them feel burnt out from all the super sale incentives. Whether brands choose to continue to emphasize much of their advertisements during the Fall or not, consumers will continue to talk most about these brands during that season. 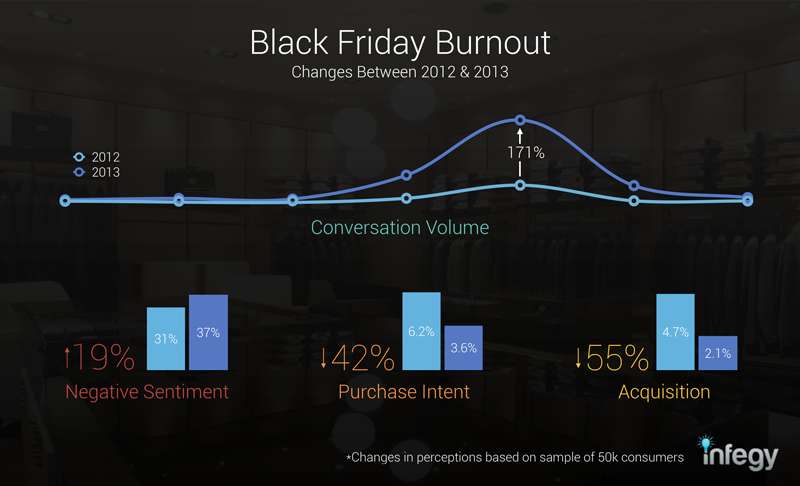 However, if brands do not recognize their obsession with Black Friday is becoming too generic, consumers’ interests will become apathetic.